Jake Owen Field in Vero Beach, Florida is now officially open to the public after a ribbon cutting ceremony on June 29th. This synthetic turf field was built thanks to contributions from the Kevin Harvick Foundation and the Cal Ripken, Sr. Foundation. The ceremony was attended by Cal Ripken, Jr., Kevin and DeLana Harvick, Jake and his supporters including his father, twin brother and other family members. Vero Beach Mayor Laura Moss was also in attendance. Kevin and DeLana Harvick, who started the Kevin Harvick Foundation, surprised country singer Jake Owen at the Foundation’s gala last year by sharing that they’d be building a field named after him in the same park he played Little League in as a child. At the ribbon cutting ceremony Jake shared that he could “hardly put into words” how much this means to him. “I’m very lucky to have friends like this (Cal Ripken, Jr. and Kevin Harvick) that are giving back to our community, the community that built me up to be the guy that I am today,” Jake said. Jake himself has given back by donating his time and concert tickets to the Cal Ripken, Sr. Foundation and Kevin Harvick Foundation at various events. FIELDS started construction of the 225′ deep synthetic turf field in May, which will be part of the Indian River Sports Complex in Vero Beach. 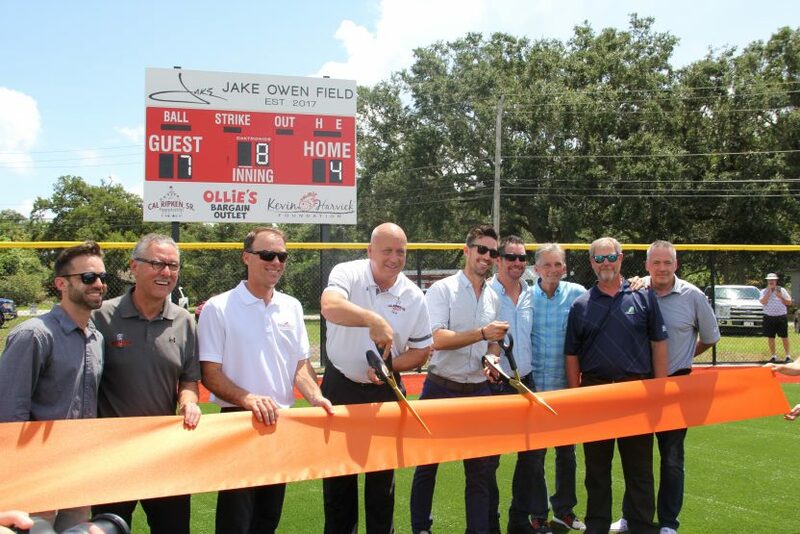 “We built this field in hopes of it becoming a central part of the community and are pleased that Jake, Cal, Kevin, DeLana (and the Vero Beach community) are so happy with the end result,” says Brian Storm, President & CEO of Sports Fields Inc.